Successful lawn establishment means doing the right thing at the right time. New seed fails because of timing, poor quality seed, improper seed selection, poor soil conditions, improper site preparation, or improper water and fertilizing. The best time of the year to seed is from August 15 to September 15. The warm days and cool night are ideal for seed germination. Spring is the second best time to seed, but could result in crabgrass and excessive weeds. Most retailers offer grass seed that is clearly marked as “sunny” or “shady” mixes. Shady mixes have mostly fescue and rye grass which are better for low light areas. For a sunny mix, look for one with at least 70% Kentucky Bluegrass. In order to grow grass from seed, the grass seed needs to be touching bare, loose dirt. Most seeding fails because the seed is not in contact with the soil. This may require raking with a firm rake and/or spreading some fresh topsoil. If using straw, spread one to two bales of straw per 1000 square feet. Spread it so that 1/3 to 1/2 of the soil is visible. If seeding in the fall, the straw should be left on over the winter. 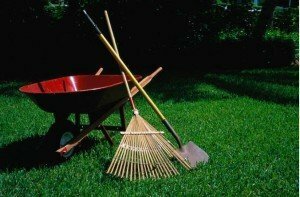 If you do not use straw or mulch, rake in the seed lightly: the teeth of your rake should just lightly touch the soil. Too much pressure will cover the seeds too deep. Cover the seed so that 10 percent of them are still visible. Sprinkle frequently enough to keep the soil moist, but also avoid puddling. This will require watering several times a day for the first couple of weeks. Mow as soon as the grass blades exceed 3 inches in height. Keep traffic off the new lawn until the new turf has filled in enough that you cannot see the soil. Expect some weeds to come up along with your new grass. 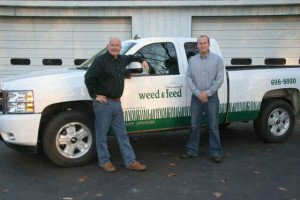 Let us know about any seeding in your lawn and we will make the necessary adjustments to your program for optimal growth.